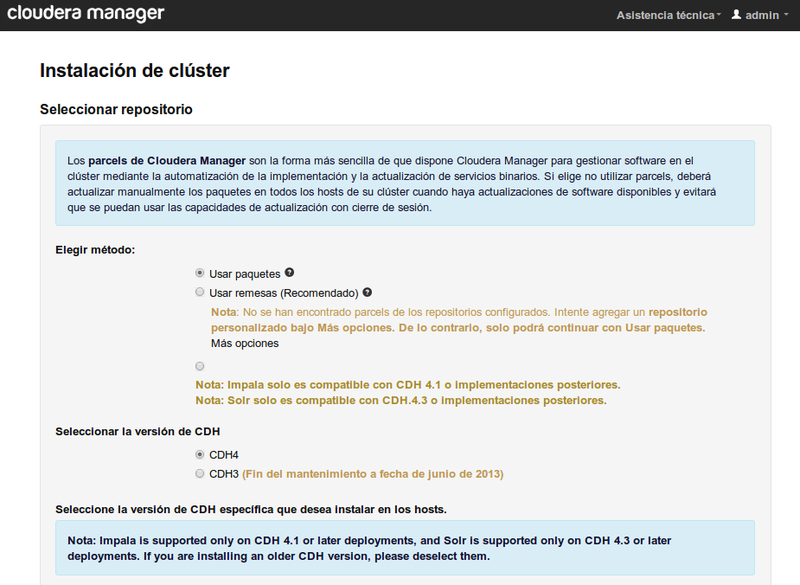 I'm trying to install a CDH4 cluster with Cloudera Manager, but after the repository selection step I can't continue, I've tried with any posible configuration, but I can't continue. It doesn't give a message or anything, just the js console gives an error with WizardStepBase.js. I'm new at this, so any advice helps. It sounds like the continue button isn't clickable. Is that correct? If so, it usually means you didn't fill out some required field. What version of CM are you using? If the documentation doesn't help, can you include a screenshot of what you've selected? I'm using CM 4.7, I was actually following that document. The button is clickable, but nothing happend, just validate if the repos url are empty. I tried adding the parcels, selecting packeges, adding the repositories.. but the next button doesn't work, and "more options" (under parcels) either. 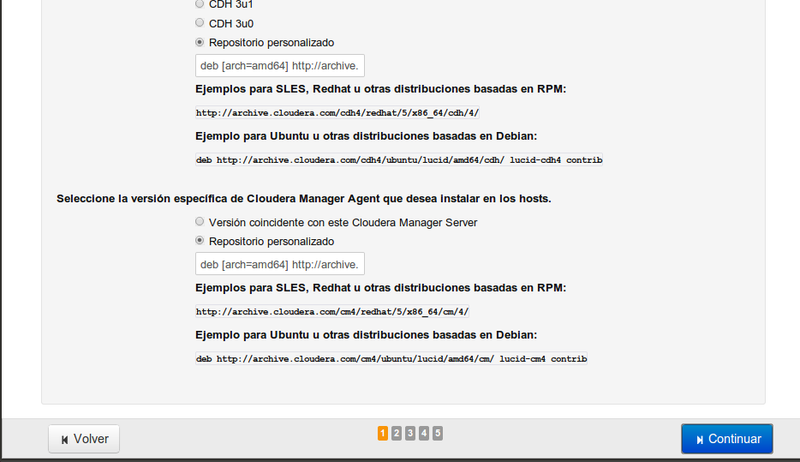 I tried adding the repos url for precise cdh4 and cm4, still not working. Could you try changing the browser language to use English and then reload that page? 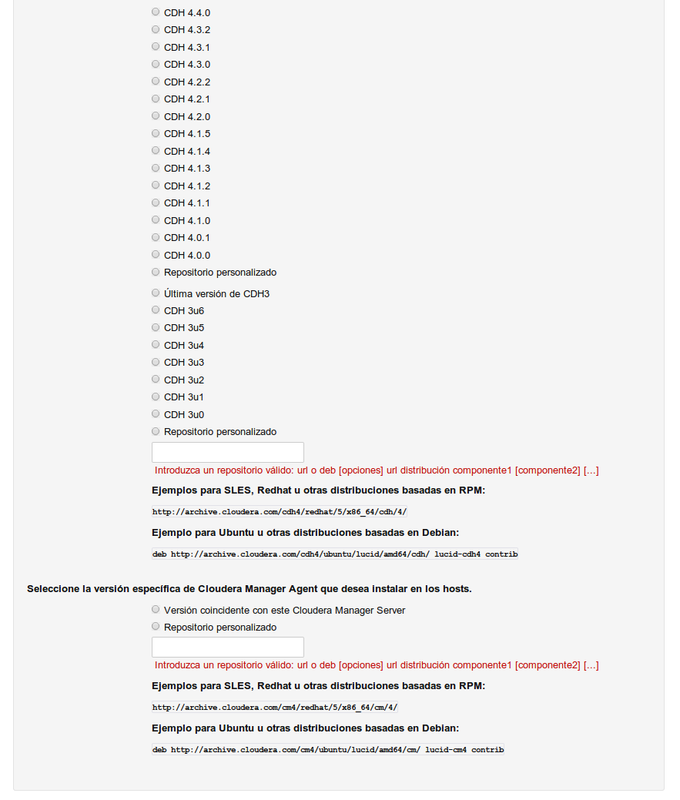 I suspect there is an escaping error in the HTML and one of the translated strings contains an extra '. It's not the solution I expected, but it worked. Thanks for reporting and helping us to diagnose this issue. We've filed a bug to track and fix this issue so it works in Spanish.